Which no. is exactly divisible by 11 ? The King of Kanchi set off to conquer Karnat. He was victorious in batttle. The elephants were laden with sandalwood, ivory, gold and precious stones taken from the conquered kingdom of Karnat. They would be a part of the victory parade for his subjects. On his way back home he stopped at a temple, finished his prayers to the goddess and turned to leave. Around his neck was a garland of scarlet hibiscus and as was the custom for all, his forehead was anointed with red sandal paste. His Minister and the court jester were his only companions. At one spot, in a mango grove by the wayside, they spied some children play. The King said, "Let me go and see what they are playing." The children had lined up two rows of clay dolls and were playing warriors and battles. The King asked, "Who is fighting whom ?" They said, "Karnat is at battle with Kanchi." The King asked, "Who is winning and who is the loser ?" The children puffed their chests up and said, "Karnat will win and Kanchi will lose." The Minister froze in disbelief, the King was furious and the jester burst into laughter. The King was soon joined by his troops and the children were still immersed in their game. The King commanded, "Cane them hard." The children's parents came running from the nearby village and said, "They are naive, it was just a game, please grant them pardon." The King called his commander and ordered, "Teach these children and the village a lesson so that they never forget the King of Kanchi." He went back to his camp. That evening the Commander stood before the King. He bowed low in shame and said, "Your Majesty, with the exception of hyenas and vultures, all lie silent in the village." The Minister said, "His Majesty's honour has been saved." The priest said, "The goddess has blessed our King." The jester said, "Your Highness, please grant me leave to go now." The King asked, "But why ?" The jester said, "I cannot kill, I cannot maim, I can only laugh at God's gift of life." Trembling in the face of the king's anger he bravely continued, "If I stay in your Majesty's court, I shall become like you and I shall forget how to laugh." Why were the elephants carrying loads of gold and other valuables ? Why did the king anoint his head with red sandal paste ? Which of the following cannot be said about the jester ? 2. He was afraid of the king's temper. 3. He did not support the king's war against Karnat. What excuse was given for the childrens' behaviour ? Why did the jester laugh at the children's reply to the king ? Why did the jester resign from his post ? Which of the following describes the Minister ? (1) He was jealous of the jester. (2) He was the king's most valuable advisor. (3) He did not have a good sense of humour. Which of the following was/were the outcome(s) of the soldiers beating the children ? 2. The children's parents went to the king to beg for mercy. Why was the king angry with the children ? In the sentence below four words have been printed in bold which are lettered (A), (B), (C) and (D). One of these words may be wrongly spelt or inappropriate in the context of the sentence. Find out the wrongly spelt or inappropriate word. The letter of that word is the answer. If all the words are correctly spelt and are appropriate the answer is (E), i.e. 'All correct'. The company has set up a foundation which helps students who do not have the necessary funds to study ahead. If this land is used to cultivate crops it will be additionally source of income for the villagers. Belonged to this cadre, you are eligible for facilities such as free air travel and accommodation. The bank has hired a consultant who will look into any issues which arise during the merger. I had severe doubts about if I successfully run a company, but my father encouraged me. In each question below a sentence with four words printed in bold type is given. 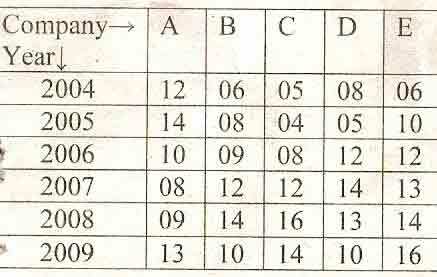 These are lettered as (A), (B), (C) and (D). One of these four words printed in bold may be either wrongly spelt or inappropriate in the context of the sentence. Find out the word which is wrongly spelt or inappropriate if any. The letter of that word is your answer. If all the words printed in bold are correctly spelt and also appropriate in the context of the sentence, mark (E) i.e. 'All Correct' as your answer. Which one of the following is a file ?